This last pregnancy wreaked some serious havoc on my skin. One minute I had that beautiful pregnancy glow, then it kept getting so oily, then I started breaking out, then it was just a mess. In the end, I ended up looking like I had aged a bit. My pregnancy was more than a bit stressful, so honestly, I'm not surprised. Well it's been over 11 months since I had her and I'm only now starting to be able to repair the visible damage. Two things that I used to use on a regular basis, before I was pregnant, was Vitamin C Serum and Hyaluronic Acid. Holy grail products, if you can find a pure formula. Some companies claim theirs is the best, but you might be getting something lacking, and watered down. The true test, of course, is the results, and in my opinion, how quickly you are them. 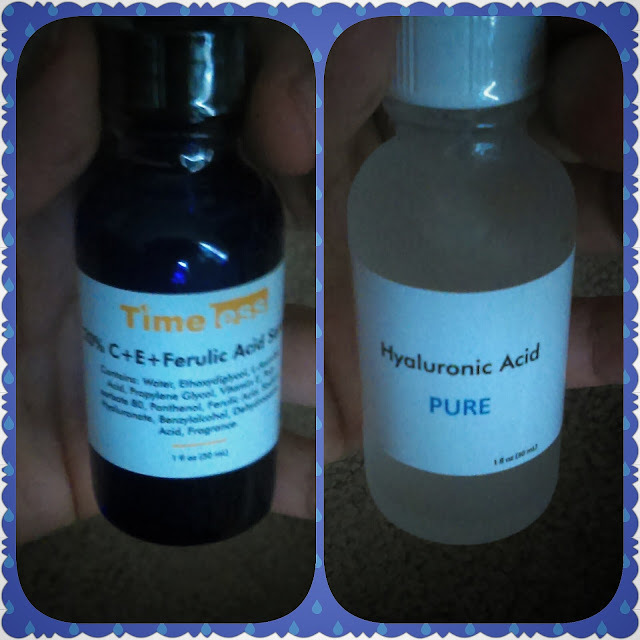 I've been using a set of Hyaluronic Acid Serum 100% and Pure + 20% Vitamin C+E Ferulic Acid Serum from Timeless and I'm ecstatic about it. They are working! My skin is looking better and better and I've only been using it for a couple of weeks. Results, people, results. I've been storing mine in my mini fridge in my bedroom so I can make sure to use it every morning when I get up, and then again before I go to bed. It feels so cool and refreshing thanks to the fridge. Now, you don't have to store it this way, as long as its in a place where direct light and heat aren't constantly hitting it, it should be okay. I am not joking when Ii say that I look forward to putting it on my face right after I wake up and right before I go to sleep. I love it so much because I can see what it's doing to my skin. It doesn't irritate it. It doesn't dry it out. It's making my skin look brighter and it feels smooth. 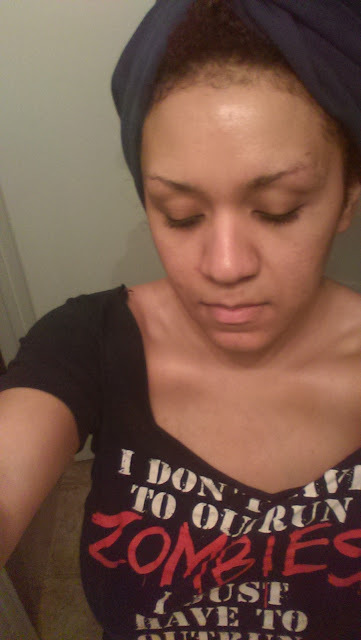 My deep set acne marks and bags under my eyes are fading away. I don't look as stressed out or tired from my long nights with the baby. I don't have to wear as much makeup as I was before. I would love to have an endless supply of these two amazing products. I need products like this in my life. The company actually has more than just Vitamin C Serum and Hyaluronic Acid. They have quite a few products to help beautify your skin. Don't forget to check out their website to see everything that they have to offer. Disclaimer: I received these products in exchange for my unbiased review. All opinions expressed are my own.